The Row's fall collection is a sophisticated minimalist affair. It's amazing the Olsens (although I heard it was mostly Ashley's thing) can put a collection together that is wise beyond their years. This jacket is AMAZING on its own but when you add the little brown belt tied in a knot, it really elevates the whole thing to another level. The narrow trousers and sandals give it a perfect modern-art-hippie-vibe (it makes sense in my head). 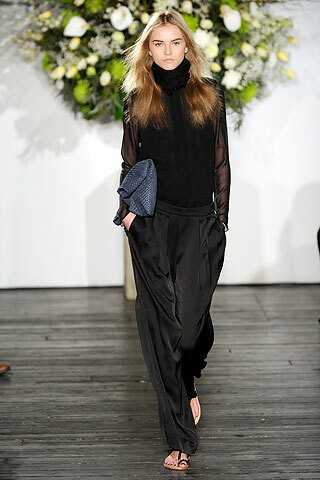 Sheer blouse and slinky slouchy trousers are the epitome of casual cool. The best part about this is the bit of sheer button down that can be seen between the cropped shirt and low-slung skirt. The whole thing is so LUXURIOUS and effortless that it hurts. This is definitely going on my inspiration board. Silk jumpsuit and long leather gloves = epic. Such a nice collection, it's effortless. Click here to visit me at LITTLE RAZZI blog!